This is a blank book that opens in two directions, with a little hasp in the middle to secure the two front covers when they are closed. 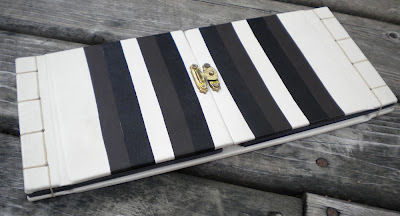 The cover is cream leather with inlaid strips of brown and black leather on each front cover. The inside of the covers is lined with cream book cloth. 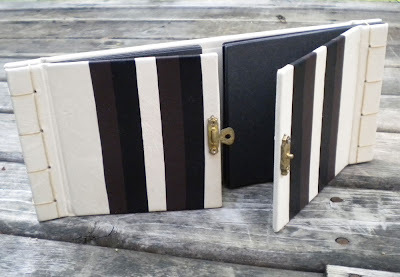 The pages are black card stock. The two spines are bound using a traditional Japanese 4-hole yotsume toji sewing. Find Rhonda's books here: www.myhandboundbooks.etsy.com. This really does bid farewell to Book Swap #11. My apologies for the confusion! Thanks for stopping by! This does look really lovely! Lucky KarleighJae! I must join in next time - this book swap has been amazing.